Marion, OH – The Marion Palace Theatre proudly kicks off the 2015-16 season with a musical production based on one of the most popular Disney movies of all time, “Mary Poppins!” With a heartwarming score, spoonfuls of imagination, and a flying nanny, the colorful world of “Mary Poppins” comes to life on the Marion Palace Theatre stage July 11-July 19. The Palace is honored to be one of the first U.S. theatres to obtain rights to present this enchanting show as a local production. Five show dates are scheduled for Saturday, July 11 at 7:30 p.m.; Sunday, July 12 at 2 p.m.; Friday, July 17 & Saturday, July 18 at 7:30 p.m. and Sunday, July 19 at 2 p.m. Patrons are encouraged to order tickets early for the best available seating. Based on P.L. 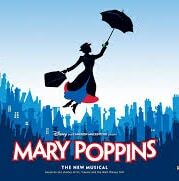 Travers’ cherished stories and the classic 1964 Walt Disney film, “Mary Poppins” the musical features astonishing dance numbers, flying actors, and all the beloved songs from the Academy Award-winning Disney film. The stage production has been created, in collaboration with Cameron Mackintosh, by Academy Award®-winning screenwriter Julian Fellowes, who has written the book, and the Olivier Award-winning team of George Stiles and Anthony Drewe, who have composed new songs and additional music and lyrics. Additional cast members are Sharon Gale as Miss Lark, Emily Yaksic as Mrs. Corry, Bruce Cudd as Admiral Boom/ Bank Chairman, Amanda Zucker as Mrs. Brill, John W. Garnes, II as Robertson Ay, Charles Groth as Park Keeper/Northbrook, Kelly Andrews as Bird Woman, Judy Little as Queen Victoria/Miss Smythe, Jay Reid as Neleus, Danielle Knight as Miss Andrew and Kevin Orth as Von Hussler. Rounding out the cast are Halle Augenstein, Addy Baird, Faith Baumgartner, Olivia Brazell, Dylan Davis, Linda Fargo, Paige Filliator, Tom Harty, Katie Haught, Blake Huffaker, Mike Mosley, Tait Palm, Suzanne Patterson, Sarah Perkins, Sydney Randall, Anna Rasmussen, Hanah Reiff, Morgan Swartz, Ryan Swartz, Audrey Watkins, Kara Weatherbee, Chris Wiley, Sadie Wink and Tanner Wink. The children’s chorus is comprised of Annie Bell, Carson Bollinger, Brody Cahill, Gabby Cametti, Jia Radloff, Carter Rawlins, Hudson Russell, Ivy Russell, Owen Russell, Macie Snyder, Delaney Tabbert and Ashley Watkins. Under the direction of Clare Cooke the artistic team includes Assistant Director/Choreographer Kristi Wink, Orchestra Director George Schram, Vocal Director Blake Huffaker, Set Construction and Design Mike Andrews, Set Artists Andrea Johnston, Chelsea Van Meter and Emily Yaksic, Costume Director Susan Wenig, Flying Director/Deck Captain Adam Radloff, Rehearsal/Pit Pianist Dee Ehrman, Stage Manager Barb Yaksic and Assistant Stage Manager Rhonda Arnold. Tickets are $40 Patrons, $22/$18 Adults, and $12 Children 12 and under. Patrons purchasing a $40 ticket will enjoy premium seating during the show, have their names listed in the summer musical program book, and receive an invitation to the “Mary Poppins” post-show on opening night. On Sunday, July 12 theatre-goers will have the opportunity to join Mary Poppins and cast members in the May Pavilion before the afternoon performance for “A Spoonful of Sugar Tea Party!” Attendees will get autographs and photos taken with the stars of the show while enjoying finger sandwiches, sides and drinks planned with children in mind. Tea party tickets are $6 and must be purchased separately at the Palace Theatre Box Office. Tickets for “Mary Poppins” and “A Spoonful of Sugar Tea Party” may be purchased at the Palace Theatre Box Office, 276 W. Center St. in downtown Marion or by phone at 740/383-2101 during box office hours. Box office hours are 9:00am-5:00pm Monday, Tuesday, Thursday and Friday, and closed Wednesday, Saturday and Sunday. Patron and Adult show tickets are also available online www.marionpalace.org. A Palace Production of “Mary Poppins” is supported by the Ohio Arts Council. Sponsored by Mid Ohio Plumbing & Gas, LLC, S.A. Comunale and Pro Co Commercial Painting & Residential Insulation. Media sponsors WMRN-AM and WYNT-FM.